An ESRI report said this was because women were more likely to work in part-time jobs or smaller firms. 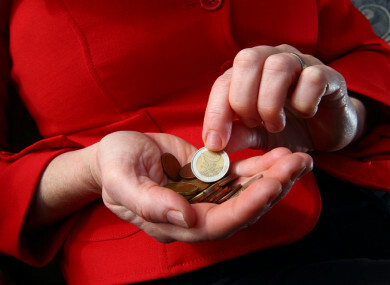 THE PERCENTAGE OF working women in Ireland earning minimum wage is over double that of working men, a report by the Economic & Social Research Institute (ESRI) has shown. According to the report, which was published this morning, 6.9% of female employees were in receipt of the national minimum wage, compared to 2.7% of male employees. In its analysis of the findings, the report said that most of the higher exposure to minimum wage employment among females was driven by characteristics of the jobs which they are more likely to hold. “Females on the minimum wage were more likely to work in part-time jobs, in smaller firms or in sectors such as accommodation and food. The minimum wage in Ireland is currently set at €9.25 an hour. Several of Ireland’s unions have asked previously that a ‘living wage’ of €11.50 an hour be introduced, while business groups say now is not the time to increase the costs for employers. The study also found that young people aged 18-29 were more likely than people in other age groups to be on the minimum wage (13.9%). “The greater likelihood of being on the minimum wage among young workers disappeared when we take account of tenure, job type, occupation and sector,” the report said. This suggests that the higher minimum wage incidence among young people is explained entirely by factors such as lower levels of experience and the type of employment undertaken. At 9%, the incidence of minimum wage pay among non-Irish nationals was over twice that of Irish employees (4.2%). Non-nationals were found to experience a higher incidence of up to 3 percentage points relative to Irish employees even after job characteristics were controlled for. The chair of the Low Pay Commission Dr Donal de Buitléir said he welcomed this study which he said “increases our ability to make evidence-based recommendations on the national minimum wage”. You can find the ESRI report, A Study of Minimum Wage Employment in Ireland: The Role of the Worker, Household and Job Characteristics here. Read: FactFind: How does Ireland’s jobseeker’s benefit compare to the rest of the EU? Email “Almost 7% of women earn the minimum wage, compared to less than 3% of men”. Feedback on “Almost 7% of women earn the minimum wage, compared to less than 3% of men”.